After working in North America for 20 years, I went back to my home country France where I recently visited Global Industry 2019; a large conference in the European Mechanical Industry. It was undeniably clear that technological progress has occurred in Europe in the last 20 years. 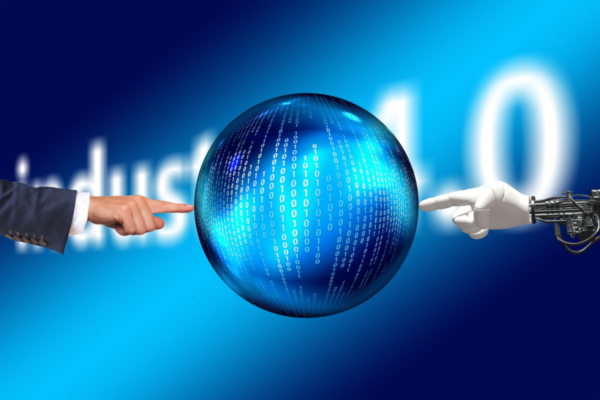 Several industry watchers are so impressed by the progress that they claim a fourth industrial revolution, known as ‘Industry 4.0’, has started. However, can we really call it a disruption, a revolution? Honestly, I am not so sure. Certainly, robots are better, more mobile and sometimes more human-looking, but still they do essentially the same job as the ones in 1994. I know this from my time at RENAULT Manufacturing Integrated Line, where we produced mechanical parts. Personally, I am more focused on how organizations manage to deal with the changing competitive landscape. Many industrial companies have differentiated themselves thanks to the ‘customization’ of their products and related services. These organizations had to learn to produce in small batches, or even with lot size one. Several things struck me during the company presentations. Firstly, changing was often difficult and when they succeeded it was always through the engagement of their staff. Secondly, the successful companies gathered support from external sources of knowledge and named universities as great sources of support. Last of all, industrial companies who were able to transform, all named lean management as a driving force in their progress. Despite the progress and success stories, it appeared to me that the transformation of the industry must accelerate in order to reach a larger group of industrial manufacturers in Europe more rapidly. The many institutional players – Regional Administrations, ‘Performance Accelerators’, Alliances, Manufacturers Corporations, etc.) – know this and are ready to implement important means (including financials) to help them. Although lean remains a useful starting point for the upcoming Industry 4.0 transformation, it is clear to me that the lean approach will not suffice to guide companies during their transformation. The lean approach must be complemented with an alternative approach that is more suited for small customized series and that can deal with the inherent variability of the customer demand and the production system. This method should allow people on the shop floor to actively contribute to their own transformation. It must be guided towards the reduction of the waiting times, as felt by the always more ‘impatient’ customer. It must have a scientific basis and encompass the whole of the company – whether it’s their creative area (marketing, design or development) or the executional side (sales, production or distribution). The Quick Response Manufacturing (QRM) approach, fully compatible with the lean approach (if not similar due to a number of aspects) has these characteristics. It accentuates the aspect of structuring the organizations around being autonomous and implementing fully accountable cross-disciplinary teams; which for many managers is a scary decision to make. Above all, it allows the production of diversified products and services with variable demand and hectic if not dysfunctional production flows (induced by the variability and frequent changes in product and services changes). QRM is based on scientific foundations (queueing theory), that are well described by academics who created and then tested this approach in the real world. This reduced the uncertainty during deployment and has the potential of securing transformations based on QRM. Finally, its participative and transverse deployment-mode allows the reduction of implementation delays within organizations. With hundreds of documented cases, QRM will allow industries to integrate all aspects and skills necessary for the implementation of industry 4.0 ‘of the future’. So, to reach the goals set by Executives to satisfy the expectations (expressed or not) of their customers, QRM will quickly unite humans and provide them with the necessary support in order to integrate supportive digital processes and technologies. QRM is the quick and lean way towards Industry 4.0; the booster in the transformation of agile companies!